It is an admitted fact that Istanbul is one of the greatest cities in the world. With our hop-on-hop-off Istanbul bus tour, we facilitate our customers to explore the city t its best in a flexible manner. Choose if you want a 24 hours or a 48 hours pass, board your open top, double Decker Istanbul hop-on-hop-off bus at just any stop along the both routes. You will not stop loving the audio commentary that will keep you engaged with it in every possible manner. Not only this, but you can also come up with your own sightseeing itinerary as soon as you hop on and hop off at any of the stops in order to visit the highlights like the UNESCO protected Hagia Sophia, Topkapi palace, the Egyptian Bazaar and so many other landmarks. You simply have to hop aboard our open top, double Decker bus and gear yourself up to witness the sights of landmarks in Istanbul, during Istanbul bus tour, one of the most fascinating cities in the world. During your Istanbul bus tour, you will find that Istanbul is brim with UNESCO listed historical sites and treasures straddling Asia and Europe, testifying its days under the Byzantine, Roman, and Ottoman rule. The excitement does not end here. Colorful bazaars, neighborhood like villages, the waterfronts along the Bosphorus straits and much, much more is there to be seen. The city is said to be a plethora of attractive landmarks for its visitors and tourists. You have nothing to do but to sit back, relax yourself and enjoy the views around you on your Istanbul bus tour. Move around in the bus and learn the stories related to and behind the sights from your onboard audio community. Whenever you are all ready, you may hop off at any of the stops and enjoy sightseeing at your leisure. You might step off to visit the astoundingly beautiful Hagia Sophia, which is one of the ancient UNESCO listed showstoppers and served as a Christian basilica and Ottoman mosque. Or you may set off to ornate Topkapi Palace which was the residence of the Ottoman sultan for more than almost 400 years. You might also leave the bus in order to roam around the stalls spreading their aromas in the Egyptian bazaar specifically called Spice Bazaar, or visit the opulent Dolmabahce, or you may feel like dropping off at Taksim square to soak up all the buzz. Let me be honest that there are a handful of many things that you can enjoy seeing and doing during your hop on hop off Istanbul bus tour. You will get the free tour map, wifi, earphone, phone app etc, all free of cost. The commentary on the bus will be available in 8 languages. The best thing is the unlimited hop on and hops off. 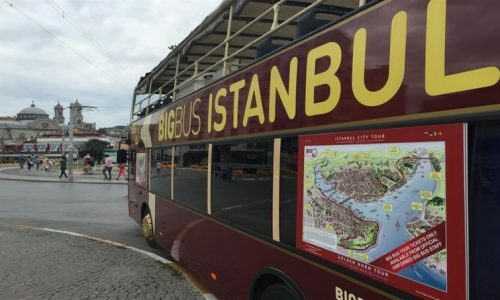 The entrance fee to the landmarks is not included in the Istanbul bus tour. When you will make the reservation, you will receive the confirmation there and then. With our convenient e-tickets mechanism, you will be sent the ticket straight away to your smart phones so that you will not have to get yourself in hustle of taking the print out of your ticket before boarding the bus. 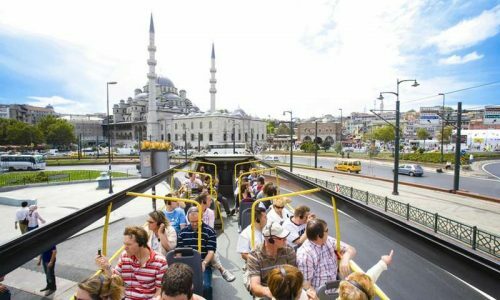 With a superb and exciting view from an open top double Decker bus for your Istanbul bus tour, nothing will be perfect in introducing the city that extends to a couple of continents i.e. Asia and Europe. This is a tour that has been designed carefully so that you will enjoy sightseeing historic sights and major landmarks on both the continents along with the personal recorded commentary that explains the culture and history of this beautiful city. As soon as the bus will leave for the Istanbul bus tour you will experience a surprising mix of culture where east blends itself into west. Tour will be highlighting top landmarks in the city in a single tour. Don’t forget to bring your camera along with you to facilitate you in capturing some memorable moments. Our tour is relaxing and safe way of exploring this marvelous city, offering a perfect introduction to Istanbul and have an everlasting fun day to mesmerize you in every manner. This tour will not be guided by a professional guide but yes the audio commentary and the complementary map given to you will be alternatives and will be compensating for those at their best. The tour will start in Sultanahmet Square between the Hagia Sophia and Blue Mosque that is next to the main street. You may start your own tour from any of the stops on the route. You can also customize your journey on your own. 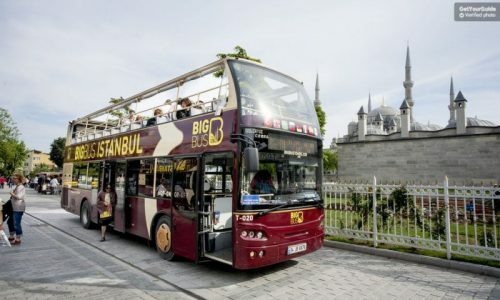 This hop on hop off Istanbul bus tour starts and finishes covering all the main and attractive landmarks in the city.